The module starts with a nuisance ambush by hobgoblins, who drop a clue about a magic staff. As random demi-human ambushes go it’s okay, the hobgoblin leader has some character even, but 20 1+1 HD humanoids rushing a fresh gang of 6th level adventurers seems a bit depressing. After an initial mention of this blue magic staff, the party encounters a plot protected NPC and PC (Goldmoon and Riverwind) who provide some healing, flash a magic staff and sing a terrible song about their tragic love affair. While the adventure suggests it’s open to the party letting the pair of Plains Indian/Adam Ant super-fan pastiches wander off, I don’t really see how this works with the focused direction of the module. I appreciate that the option is mentioned, but the structure kind of falls apart if the players decide they don't care about the staff, and the clues it leads to (though the staff is not needed to complete the adventure). A few encounters in idyllic and picturesque places later the party should really have been bludgeoned with the idea that there’s a magic staff, it’s blue, and there are draconic baddies looking for it. Then an army of dragons and dragonmen invade, a scaly blitzkrieg that rapidly fills the map while the party theoretically wanders to the poorly defended town of Haven, now packed with refugees. The town offers no refuge and the group needs to run off into an elf-wood straight out of Tolkien or alternatively, a fairy haunted wood ruled by a unicorn. Unwinnable fights push the party into parley with the elves or unicorn and they learn an important lesson about always judging creatures encountered based in their appearance. With a cryptic message from a unicorn and some gratuitous pegasi the party is off to a new land, populated by some kind of Sioux-Mongol derived plainsmen noble savage clichés. The brave natives are foolhardy in their insistence that they can stop the dragon army, and are suffering for it more then the quasi Byzantine city of Haven. The terroized and despoiled plains push the party to follow the unicorn’s advice and head to an ancient city. Now the party is in an ancient city. It’s in a swamp and crawling with dragonmen. Since dragons plus swamps always equal black dragons in D&D there’s a few of them as well. Fight some draconian soldiers, free or slaughter some slapstick gully dwarves, and confront a giant black dragon who is (properly I think) fond of hit and run tactics. The dragon may be destroyed instantly (err heroically) by the staff and some magical discs discovered that allow clerical casting (Discs of valuable metal, engraved with the true holy texts in a fallen land? Hickman is a Mormon by the way...not to complain, gold discs are pretty cool.) With that it's on to Dragon's of Flame DL-2, or a long session of weeping in the shower because this module was so impossible to play or run in a fun manner. description straight from a creative writing workshop. Most importantly the tone demands heroes, in the least nuanced sense possible, and if it’s not to be utterly depressing, it requires the heroes to succeed. It’s a special kind of fantasy, one that I associate with the 80’s, crystal accented pewter wizard figurines and heroines with feathered hair. This fantasy isn’t popular in older D&D game circles these days, I know it annoys me, but perhaps this is just a matter of fashion. The gonzo cheer of 70’s D&D camp, murder-hoboism, and gruesome metal album art as monster manual seems ascendant right now, but high fantasy kitsch was a big thing for quite a while and has an appeal. Still, it’s really hard to play game of D&D as high-fantasy kitsch, the resolute seriousness would be maddening and descend into the same jokes and beer that a good D&D game always does. The fancy adjective boxed text becomes a satire at this point, and the party starts looking for things to do besides help DM PCs with silly names. Besides the tone issue, D&D’s mechanics are at their worst in a heroic game, the crafty tricks that D&D characters depend on to avoid combat and other dangers seem contrary to the spirit of the game world, and thus combat has to be winnable. The dragon kryptonite staff is fine, it's largely optional to the module, despite it's seeming importance, but every other encounter appears designed to allow a victorious party - remember this party is 5th level (though the ACs of the pre-gens are very bad for that level) and armed with +2/+3 weapons. I also don’t really get how the encounter stream works. It seems like the story central encounters are scripted to occur at intervals, and then others in certain large areas of the map occur between these depending on where the PCs are. The other mechanic at work here is a dragon army surging across the map and changing the encounter tables. There are also marked locations. This seems a poor way of running the module, designed to impart a particular narrative arc. As a GM I am sure my players would start avoiding the programmed encounters when possible, either out of a perverse desire to screw with the module’s hubris or because once they realized that with an army of dragons was at their back, random encounters become doubly a waste of time and resources. Worse, the combat encounters are almost all of the “they attack until killed” or the “you can’t win, you will be captured or surrender to move the plot along” variety. This isn’t to say that things are stated up to be unstoppable, they are largely fairly weak, and the human NPCs are appropriately leveled (or un-leveled) meaning that as a sandbox, DL-1 isn’t unworkable. DL-1 is also a straight railroad, from lovelorn princess, thru flight from a bad army, to ancient ruins with magical staff which defeats the unstoppable dragon (well I suspect it’s actually a rather stoppable dragon for a 6th level party). This is just awful. The opposition is largely both too aggressive and too weak to stop the party, presenting a series of die rolling delays rather than options for players to weigh risk and reward with a real danger of character loss. Indeed there is little in the way of interim reward for the characters, treasure is rarely mentioned (and mechanically treasure/XP represents D&D’s way to incentivize solving problems ), and there is not much adventure to experience if the party strays from the railroad – only an endless fight against dracononians, who are entirely unreasonable and immune to things like player selected goals. This makes for a boring adventure to me, and seems more a way for the GM to experience epic sweep then a game played by players and GM. There’s also something creepy and dishonest about the way that DL-1 glosses over the horror of the marauding alien army killing and driving everything before it. This is Dragonlance's morality, defined as lawful good, and it's deeply flawed, willing to create a world of horrors as a backdrop and then demand that the players focus on poses of noble sacrifice and heroics in service of a epic plot. The plot isn't which is not about finding food sources for refugees, or a way to communicate with the Draconians and reach some kind of understanding, but about heroic quests for magical gee-gaws, and this eliminates one of the more interesting elements of D&D games, the moral one, where players decide (usually based on a piece of throwaway GM description) what's right and wrong and what part of the world is worthy of aid or destruction. Despite Dragonlance's moral bullying, my GM experience tells me a lot of players will want to solve the invasion problem different ways, there own ways, rather than embarking on a bland quest for an unknown whatever with a magical staff. These options should be available, there should always be multiple solutions in a module, and they need not all be optimal. Adventuring as branded slave soldiers of a city now allied with the Dracononians is not a wrong outcome, it’s how the game world grows from player choices. Kender are horrible, not the idea of Kender, Isolationist kleptomaniac Halflings are great, but that they are a player race and so beloved by the game writers that they get rather absurd powers. For example a Kender staff sling somehow does 1D6+2 damage as a melee weapon. I true 80’s style the module justifies this by giving it a martial arts weapon name “as jo-stick”, but when a stout club with a nail in it is a D4 weapon, and a long sword a D8, no stick should be the best weapon available, especially in the hands of an obnoxious kleptomaniac hobbit. What’s worse though, and the real issue with Kender is that their cutesy, anti-social behavior is ripe for exploitation and abuse by disruptive players. Besides dousing the absurd high fantasy schlock in a bit of grimness (which an invading army of draconic-fascists does pretty effectively), it’s hard to figure out how Dragons of Despair can be fixed. There’s the core of something interesting here, but it’s not in the party of pre-generated adventurers with epic backstory returning the Gods the Krinn. It’s in the profoundly ugly apocalyptic scenario that Dragonlance is built on. Krinn is a high fantasy idyll and it get smashed by an army of evil rather convincingly in DL-1. What’s left is an apocalypse that Rather than have the players pick heroes destined for glory, let then roll up poor refugees and thralls of the invading dragon army. Don’t have the party start the Dragonlance modules as 4th – 6th level, have them begin as 0-level farmers and townsfolk, or 1st level deserters from the destroyed armies. This is the Eastern Front in Spring 1941, or Germany during the 100 year war, and the party has a huge pool of replacement refugees when their characters, unprepared to take on even the pushover enemies (the monsters in DL1 are pushovers for a 6th level party) are slaughtered horribly. Ultimately the party will resort to a scramble to find safety. An open scenario allows the map to be loosened and the story made less important. Scripted encounters become random, and the party decides which faction they want to aide. I’d run the module like this: village is Guernica’d by dragons in advance of Dragon army, survivors (a 0-level funnel) have chance to 1) regroup, fight and die 2) flee 3) lay low and accept their new scaly masters. All three choices allow the staff quest to get introduced later without Goldmoon, if the players want to follow it. A perfectly good option is instead have the party sent to find the staff by the Draconians, a crafty group of 1st levels can take on a magic-less 5th level cleric and 5th level fighter, or simply steal it. Not sure what the consequences are, but the character’s village will surely be spared and that’s how player agency works. Another option here is to allow the players to flee into the scary woods and start trying to be guerrillas or bandits. The woods will mean that the party encounters cruel elves or strange tree spirits. These forest dwellers, the city of Haven, the Draconians and the Plainsmen all represent factions. DL-1 makes no use of this, but it’s here that the railroad can be uncoupled (just as in Rahasia). Railroads happen when the game is supposed to be a story, and there’s one ‘right’ way to go forward. With non-heroic characters and factions that have individual, conflicting goals a story can evolve that’s robust enough to deal with player decisions to fight the forest elves or take a band of refugees to look for water transport. Since the Black Dragon Onyx is a powerful faction herself, allied with the Draconians and enslaving the Gully Dwarves (I’m okay with Gully Dwarves if one views them as goblin reskins), she can intrude on any fragile structure of alliances and faction agreements the PCs build, pushing the adventure more naturally into the ruins. To accomplish this it’s best if Onyx isn’t simply part of the Dragon invasion, but another faction, perhaps a hold-over, hiding in her pit with a few debased and inbred Draconian servants since the last Dragon invasion. The Unicorn, the Elves and eventually Haven’s priests may discover her possession of the discs that bring back Cleric magic, and the Draconians are likely to know this as well. Why does Onyx covet these discs, and what does she want for them? Can the black dragon be played off against the other factions, and who should the party support in this coming fight? It seems like this is the seeds of an interesting adventure capable of bringing a party of 0 Levels up to about 4th or 5th level with plenty of room for replacement PCs. Dark Sun is Krinn a thousand years after the Dragons win. Let the Dragons win, because no small plucky band of heroes can stop an army (at least not if you want to use the rest of the DL series of modules). Your Dragonlance game will be better for it. I couldn't help thinking as I read this that many of the features you discuss are the foundations of the slippery slope that led to 2nd edition being so bland. I do wonder that, but I suspect that Dragonlance was responding to a desire among D&D players as the game became more popular among younger players. Heck I remember the desire to have my high level wizard be unstoppable and perform heroic type activities. I don't have an issue with this kind of play, I just think D&D rules don't work with that sort of play. Maybe 2E and on work better for that kind of thing, 4E players don't die easy for example. To me it's just a different game - can't defend the elf poetry though. I don't think I have ever seen a 4E character die. I know I tried kamakaze-ing my fighter more then once. Never could really get him into much trouble. After a while I just stopped tracking hp. Somehow I would get most of them back by the end of the encounter. Never failed. It's one of the many reasons I dislike 4E. I happen to be a Dragonlance fan, though I do agree the DL series is rather linear. My suggestion, if you want a Krynn flavored game, get the Dragonlance Adventures book. It hits the highlights of the world without getting to bogged down in the details. Just skip the moon phase rules, their kinda convoluted. And giving the dragon army the staff would be a bad idea. It's one of the McGuffins that help bring back the good gods, the other being the discs. They don't come back, the only cleric is the one leading the dragon armies. That would certainly make the campaign more interesting. Yeah I ain't trying to say Dragonlance is bad-wrong-fun or anything, I just think it's set up in a way to make a poor game of 1e D&D. The linear campaign might work for something more tactical combat focused (like 4E) but with the system 1e system it's gotta be Mary Sues and plot immunity to make it work. In my opinion early D&D systems are most appropriate for dungeon crawls or wilderness adventures with a flattish power curve. At the best it transforms into a domain game and a game of factions. As to the idea of giving the staff (or the discs) to the Draconians in exchange for something like allowing the tree town to be a free-city with limited self rule might not be the best idea, but it solves the immediate problems of Dragons of Despair with fewer murdered refugees and enslaved villagers in the view of the players. For me the key to a good game of D&D (especially at mid-level) is that the players make these kinds of decisions (which of course means that the unicorn needs to convince them to go to the ruins rather then simply be mystical and fatalistically noble). It becomes the players rearranging the game world through their choices, reasoned or absurd. The players get the world they create, and as a GM one just selects its starting state. Has a nice dungeon map if you ignore everything else. I was probably 14 and loved the art i now find kitch hippy schmaltz. There are three DL games every friday in my club. Kender are mostly jerks but see the reactions if anyone wants to play a bitter kender with scars who hates both sides for his family dying. People are outraged. But a friendly minataur is OK. They seem to have epic was stuff and every dungeon has some crucial mission factor for the war. I played for a bit but my setting is a bit nasty and nobody in my club runs a game that I like really so I run 2&1/2 games a week. Out of whole series a few maps, a few cute elves i fancied as a teen, i do like draconians as a monster but mine are aztecs guarding the volcano entry to Tiamats hell. I never realized the mormon link but now it makes sense. Id like to see elric go to krynn, kill all the gods and let loose demons and elementals till it is an apocalyptic mess where every DL map is repopulated as monster hell holes with zombie versions of fan favorites. I don't mind the art, it's like the cover of Castle Cadwell (which would have made a great circa 2008 electro album cover), it just makes me think over the top 80's kitsch - which to me seems pretty contemporary (well six year out of date maybe). I really do see the appeal of the heroism and EPIC fantasy, it's just I don't see running it as 1E AD&D or anything with similarly harsh combat - how does it work when every 4th Dracononian has a Web spell? Seriously, no party is going to survive 3 web spells - there's no save. Draconians are ok, I'd model them on the army of Imperial Japan a bit more, but that's just me. 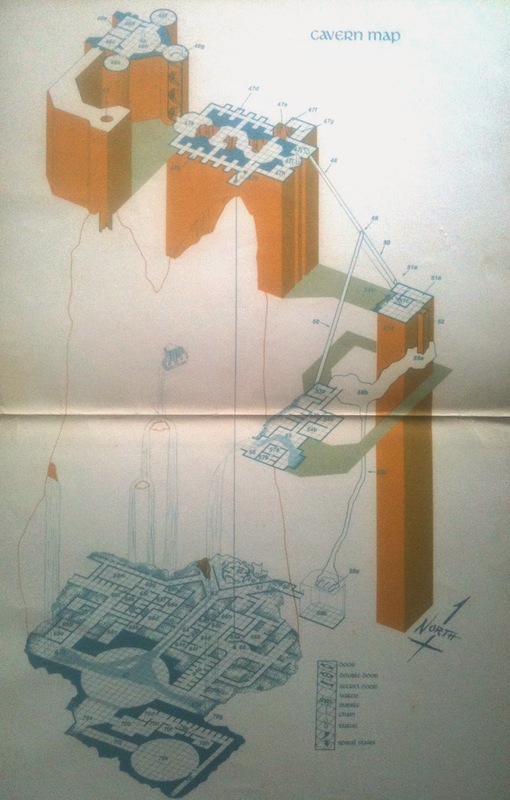 The maps - I don't like the maps, I don't find them pretty or especially useful. Design wise the map is good, but the actual physical map seems to be iso for the sake of iso when a series of maps for the basically flat levels and a small elevation/iso map showing their connections would be much clearer for me. Konsumterra: your last sentence, pretty much sums up the Chaos War and War of Soul arcs. They were pretty much where I cut sling load on trying to keep up with the novels. I ran DL1 back in the day (while in Elementary School, no less.) It's pretty railroady but at the time no one minded too much. If you like a heroic story, it's not terrible. It's also got some great bits worth salvaging - a great dungeon at the end, a nice idea (nice world ravaged by evil on the rise), and a dragon - which was a rarity in the games I played. Overall though, you're right - it's not what it could be, and it's less fun than it should be. That dungeon at the end cries out to be stolen for other uses, even if you like nothing else about it. It's a great dragon lair. "Let the Dragons win, because no small plucky band of heroes can stop an army. Your Dragonlance game will be better for it." Eh, I don't want to play the plucky band of heroes doomed to fail against the evil hordes. I want a chance to win. In 1941 Russia, I want to play soldiers, not hapless refugees doomed to die. I want a shot at the fiction (from The Hobbit to The Black Company) not the fact (most of the peons die). I understand your desire to have a chance of player victory, and I wouldn't eliminate it completely, there's still an ancient black dragon the party of (likely 3rd level by the time they get to the ruins) party could slay and then the module would be as written. What I would need to run this is A) the possibility of death for the PCs, and the ability to add new replacement characters without derailing the campaign B) the chance for the players to make meaningful choices about how the dragon-war unfolds. 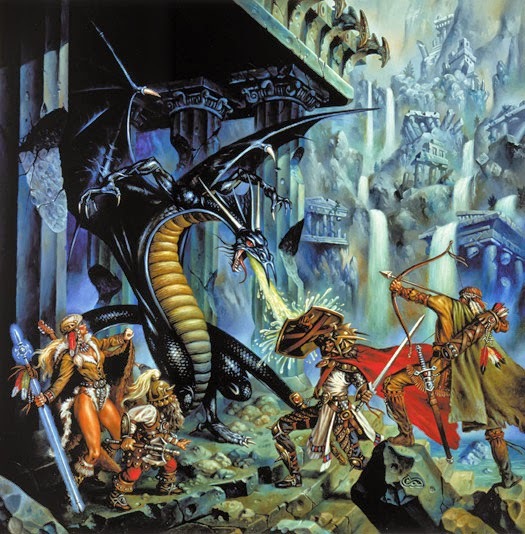 They can fight to the last, take on the dragon's rainbow coalition all the the way to Tiamat, but the survivability of that option seems minimal within the rules Dragonlance is written for. The players need to also have options to retreat, retrench, cut deals or otherwise act in the ways that D&D players often act. To facilitate this I want a multipolar game world more akin to 1900's Europe then a bipolar one with Dragons v. Everyone else. The Dragons are evil, but they ain't stupid, they'll work with allies (they do already with goblinoids), why not ally with the PCs or a client state version of a human city? Perhaps I oversell the chance for defeat in the last few lines, but it'd need to be there for me to use the Dragonlance world, and not only as a terminal failure point. The Dragons/Tiamat taking on allies is actually canonical in Dragonlance, if that helps any. Plenty of humans, singular, in the bad guy alliance. And some whole human states joined them, too. So I pretty much think you could do that in a Krynn-based game. The modules don't facilitate that, but if you're tossing the central plot of the modules why even care about that? By the way, I loved that there was a dragon in there. I played many games as a kid, and dragons were always held off as unbeatable boss creatures you could only fight if you got to high level. We didn't play any one game long enough to get there. So when I got this module that tossed a dragon right at you, I had to get it. And I still love that about it - it was Dungeons & Dragons, finally, in a way that the Dungeons & that One Dragon in G3 hadn't been to date. Don't get me wrong, it's a railroad and heavy-handed, but some of what you'd like to see is in the series (refugees, places for tough choices, people selling out to the dragon side, etc.) is there, later. They don't execute it that well much of time, but it's there. I also really like that dragons are in Krinn from the first adventure on. While I personally take a Shadowrun attitude towards dragons (demigods), I find myself coming around to the idea that they are these under 10HD creatures (unlike my demons - more like devils) that have a variety of special powers but aren't indestructible. 4) also the goblinoid races, driven into the barren and waste places of the world, were halfling/kender subsitutes. 5)The goal wasn't saving Krinn, and the dragon armies were a faction among many, maybe the worst and most powerful, but not the only option for your wealth/survivability motivated party. When I was younger someone gave me one of the dragonlance modules for a birthday. My sole recollection of it is that Tika (one of the PCs, an ex-barmaid turned fighter) had a frying pan that did 1d8 damage. As a teenager I ran a party of 4 teens playing various of the pre-gens through this module. It was fun, the title, the invasion and sense of impending doom, the quest and finally the dragon combat etc. I think a couple of the pre-gens died there and I could not work out what to do so waved my hand and they were present in the next module of the series. Tika with the d8 frying pan that brings back memories! Now I look at it and think urgh...so different to what I currently run. Open sandbox with factions, with almost total player agency (things do happen without them), the world is shaped by their actions. I like your take on DL-1, refugees, guerrillas or soldiers/deserters, junk the story and let them have at the world. Also strip out the Tolkien elves they would have to be more alien and less friendly, dangerous to all who came into their controlled area. A fun, thorough review, and I appreciate your acknowledgment of your personals tastes and potential biases. I do think (and admittedly it's been a long time since it first came out, so my memory may be inaccurate), that when the DL modules came out, they were actually written in a way that was reactionary to what was typical in a D&D module at the time, so that many of the elements you point out as "bugs" are actually "features." I'm currently running the revised edition of Dragons of Autumn for a group of players. I have to admit I'm a little sad to see so much disdain for the adventures but I can certainly understand the frustration. Since none of my players really know anything about Dragonlance, I certainly don't have to worry about them being familiar with the plot. As such, scripted events can seem player-caused and genuinely surprising. Regardless, no player wants to be railroaded. The revised edition allows for some more flexibility in player action (including players using their own characters instead of the pre-gens) but there are certainly still lots of "you must do this or else..." moments which I know most players and GMs detest. For an experienced DnD group who are used to shaping the world around them and having the freedom to do whatever they want, Dragonlance is going to be terrible. For a more casual group that and don't mind some limitations (only good alignments, willing to follow the "quest", etc.) and want to play as epic heroes fighting dragon armies in a detailed fantasy setting it's pretty awesome. I haven't seen the revised versions, and I think Dragonlance as a setting has some interesting elements, being an ongoing high-fantasy apocalypse. I think it one could play it as a straight sandbox, even with a gang of antisocial PCs who were in it for themselves (a lot of dirty dozen/Kelly's Heroes sort of situation can arise in a Krynn reeling from the advance of the dragon armies. There's a distrust for the players, saccharine characterization/detail, and a forced moralism in Dragonlance products (I find it in Hickman's other work as well) which somehow combine with/for an adversarial approach to GMing that really bugs me, and make the modules as written rather distasteful - despite the good ideas within. To me it doesn't matter if scripted/scene based play 'feels' like it's player decision driven - that it isn't risks the railroad and encourages bad GMing.